EARLY CLASSIC PERIOD: 300 A.D. - 600 A.D. COMPLETE WITH MINERAL DEPOSITS IN CREVICES AND AND PIGMENT TRACES . NO REPAIR OR RESTORATION. SOME DAMAGE TO SPIKE DESIGN. A HIGHLY UNIQUE CERAMIC DESIGN ONLY FOUND IN THIS CULTURE. MOST OFTEN, THESE ARE MUCH MORE DAMAGED THAN THIS VERY LARGE, FINE EXAMPLE. For discriminating collectors of rare Mayan ceremonial objects, this is a LARGE and INTACT ceramic ritual bowl featuring a spiked design to represent the Ceiba tree. To the ancient Mayans, the Ceiba tree was the most sacred of all the trees. They believed it was the symbol of the universe and a direct line of communication between the three levels of the earth, depicted as the roots, trunk and branches. The roots connected the underworld to the realm where humans lived (the trunk), with its vast branches reaching high into the upper heavens. The Ceiba tree was their access to both realms - death below, and the gods above. Ritualistic ceramics sometimes were dramatically adorned with three-dimensional representations of the trunk thorns of the Ceiba tree and they make for visually stunning objects used in religious ceremony. This spectacular example is larger than many examples known and it is in much better condition than most since the spikes are often heavily damaged, unlike this piece, having only moderate damage to the impressive array of "thorns" on the entire circumference of the square base bowl. This ceramic was amazingly found INTACT and has NO REPAIR OR FABRICATION. Its robust construction most likely protected it over the ages. Traces of pigment can be seen with mineral deposits on surfaces and in crevices, attesting to its authenticity and un-restored nature. With our highest recommendations for fanciers of the magnificence of the Pre-Columbian cultures of ancient Central America. Includes our written unconditional lifetime certificate of GUARANTEED AUTHENTICITY. This is a highly unique example of Mayan art and ritual in ceramic. Of all the ancient cultures of the Americas, no civilization has held more intrigue and secrets for so long as that of the Mayans. In 1960, their language code of glyphs was finally deciphered and forever changed our view of what we initially thought was a peaceful and harmonious society. On the contrary, the Mayan Culture of the latter years was bathed in the blood of vicious warfare and astounding levels of human sacrifice. Their technology was so advanced it is no wonder many believe they received intelligence from extra-terrestrials. Despite our recent discoveries of Mayan mathematics, astronomy and calendar technology, the Mayans still leave us with many mysteries. Their love of war caused them to manufacture spectacular weapons with inherent beauty and artistry. Their ceramics depict a fascinating culture of status, sacrifice and deep religious devotion to a number of strange gods. Archaeologists divide the Mayan Culture into different periods - LATE PRE-CLASSIC / PROTO-CLASSIC (300 BC - 300 AD), EARLY CLASSIC (300 AD - 600 AD), LATE CLASSIC (600 AD - 830 AD), TERMINAL CLASSIC (830 AD - 950 AD). The earliest days of the Maya date back to 2000 BC when small farming villages first appeared in the highlands and Pacific coastline of Guatemala. Crops such as corn, squash and beans made up the staple of their diet and are believed to have been brought from previous migration through Mexico. 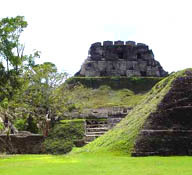 The Maya pottery styles were unique to the early Maya settlements, though. By 1000 BC, villages sprang up in the lowland regions. The Maya lived in the same locations for centuries and in a continuous state of architectural improvement and expansion leading up to the magnificent 'super-cities' we associate with them today. By 300 AD. full-scale cities were being built with stone featuring massive plazas, temples and pyramids reaching 20 stories high. It is no wonder that some believe that extra-terrestrial beings brought their knowledge to the Maya. By 300 AD, the first inscriptions suddenly appeared in Maya sites. These early inscriptions were so beautiful it was as if the gods had delivered it to the Mayan themselves! Forward to 600 years later and the inscriptions cease. The first comprehensive writing system in Pre-Columbian America was invented by the Maya. Among the mysteries of the Maya are their amazing understanding of astronomy along with the development of an accurate calendar and mathematical system. Their number system was based on units of 20 and included a concept of 'zero'. The skills of the Mayan craft are exemplified in their stone and wood carvings, flaked stone objects, pottery and personal adornment. Much of their art centers around their devotion to a religion that is both fascinating and gory. Blood-letting rituals were the norm and many acts of war were motivated by the capture of vast numbers of their enemies for ritual human sacrifice that would run for days on end, forming lakes of blood and fat at the bases of their stone pyramids that defy architectural explanation. Our understanding of the fascinating MAYAN CULTURE was completely wrong and misinterpreted until as recent as the 1960, when major achievements were made in the deciphering of their glyph language. Elaborately designed ceremonial cities lacking any obvious defenses initially led us to believe that the Mayans were a peaceful theocracy living in ideal harmony with their environment and each other. We could not have been further from the truth. Lowland city-states lived in constant warfare with one another and the thirst of their gods for human blood and sacrifice seemed impossible to satiate. Perhaps a lesson for us today, recent scientific analysis of the demise of the highly advanced Mayan civilization now answers the biggest mystery of all - "What ever happened to the ancient Mayans?". Long-term high population density (500 people per square mile - the highest in the world at the time) of unbelievable proportions put a strain on their agricultural system that was impossible to sustain. The effects of nutritional deficiencies are evident in bone and tooth analysis on graves dating to the Late Classic Period. It is most probable that starvation put unbearable sociopolitical stress on the society to either kill each other for food or die of hunger necessitated by the technological advancement of warfare and its escalation. AGE EARLY CLASSIC PERIOD: 300 A.D. - 600 A.D. CONDITION COMPLETE WITH MINERAL DEPOSITS IN CREVICES AND AND PIGMENT TRACES . NO REPAIR OR RESTORATION. SOME DAMAGE TO SPIKE DESIGN. NOTE A HIGHLY UNIQUE CERAMIC DESIGN ONLY FOUND IN THIS CULTURE. MOST OFTEN, THESE ARE MUCH MORE DAMAGED THAN THIS VERY LARGE, FINE EXAMPLE.